Roman shoes: a man's, a woman's and a child's shoe from Bar Hill Roman Fort, Scotland. By the 15th Century, pattens became popular by both men and women in Europe. These are commonly seen as the predecessor of the modern high-heeled shoe, while the poor and lower classes in Europe, as well as slaves in the New World, were barefoot. In the 15th century, the Crakow was fashionable in Europe. This style of shoe is named because it is thought to have originated in Kraków, the capital of Poland. 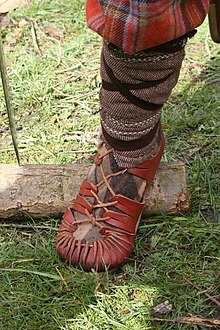 The style is characterized by the point of the shoe, known as the "polaine", which often was supported by a whalebone tied to the knee to prevent the point getting in the way while walking. Also during the 15th century, chopines were created in Turkey, and were usually 7-8 inches (17.7-20.3 cm) high. These shoes became popular in Venice and throughout Europe, as a status symbol revealing wealth and social standing. During the 16th century, royalty started wearing high-heeled shoes to make them look taller or larger than life, such as Catherine de Medici or Mary I of England. By 1580, even men wore them, and a person with authority or wealth was often referred to as, "well-heeled". 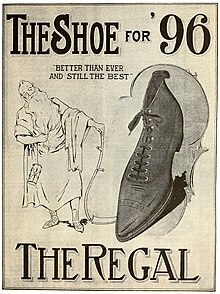 Advertisement in an 1896 issue of McClure's for "The Regal". On January 24, 1899, Humphrey O'Sullivan of Lowell, Massachusetts, was awarded a patent for a rubber heel for boots and shoes. Diagram of a typical dress shoe. Note that the area labeled as the "Lace guard" is sometimes considered part of the quarter and sometimes part of the vamp. The midsole is the layer in between the outsole and the insole, typically there for shock absorption. Some types of shoes, like running shoes, have additional material for shock absorption, usually beneath the heel of the foot, where one puts the most pressure down. Some shoes may not have a midsole at all. Cutaway view of a typical shoe. Many athletic shoes are designed with specific features for specific activities. One of these includes roller skates, which have metal or plastic wheels on the bottom specific for the sport of roller skating. Similarly, ice skates have a metal blade attached to the bottom for locomotion across ice. Skate shoes have also been designed to provide a comfortable, flexible and durable shoe for the sport of skateboarding. 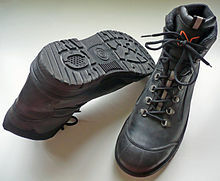 Climbing shoes are rubber-soled, tight-fitting shoes designed to fit in the small cracks and crevices for rock climbing. Cycling shoes are similarly designed with rubber soles and a tight fit, but also are equipped with a metal or plastic cleat to interface with clipless pedals, as well as a stiff sole to maximize power transfer and support the foot. Some shoes are made specifically to improve a person's ability to weight train. This male dress shoe, known as a derby shoe, is distinguished by its open lacing. Formal high-end men's shoes are manufactured by several companies around the world, most notably in England, France, Italy, and America. Notable British brands include: Church's English Shoes (est. 1873), John Lobb Bootmaker (est. 1849), Edward Green Shoes (est. 1890), and Crockett & Jones (est. 1879). Both John Lobb and Edward Green offer bespoke products. In between the world wars, men's footwear received significant innovation and design, led by cobblers and cordwainers in London's West End. The most notable[according to whom?] French product is made by J.M. Weston. Armani of Italy was a major influence on men's shoe design in the 1960s–1980s until they returned to the larger proportions of its forebears, the welt-constructed Anglo-American dress shoe originally created in Edwardian England. Another well-known Italian company is Salvatore Ferragamo Italia S.p.A.. The remaining elite[clarification needed] American companies are Allen Edmonds and Alden Shoe Company. Alden, located in New England, specializes in genuine shell cordovan leather from the only remaining horse tannery in America (Chicago) and is completely manufactured in America, whereas Allen Edmonds, of Wisconsin, is a larger company that outsources some of its production. World's largest pair of shoes, Riverbank Center, Philippines – 5.29 metres (17.4 ft) long and 2.37 metres (7 ft 9) in wide, equivalent to a French shoe size of 75. The measure of a foot for a shoe is from the heel to the longest toe. Shoe size is an alphanumerical indication of the fitting size of a shoe for a person. Often it just consists of a number indicating the length because many shoemakers only provide a standard width for economic reasons. 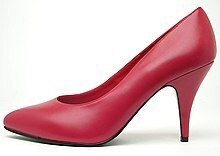 There are several different shoe-size systems that are used worldwide. These systems differ in what they measure, what unit of measurement they use, and where the size 0 (or 1) is positioned. Only a few systems also take the width of the feet into account. Some regions use different shoe-size systems for different types of shoes (e.g., men's, women's, children's, sport, or safety shoes). Shoe insert, insole or inner sole — orthopedic or regular insert of various materials for cushioning, improved fit, reduced abrasion or to keep shoe fresh and increase its durability. These include padding and inner linings. Inserts may also be used to correct foot problems. ^ "The Scottish Ten". The Engine Shed. Centre for Digital Documentation and Visualisation LLP. Retrieved 14 October 2017. 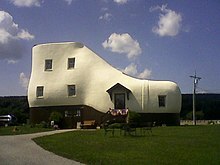 ^ "Lady's Shoe, Bar Hill". Retrieved 24 May 2018. ^ "Child's Shoe, Bar Hill". Retrieved 24 May 2018. ^ Connolly, Tom. 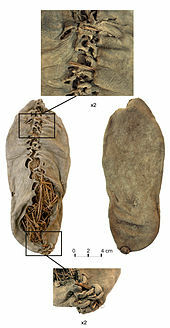 "The World's Oldest Shoes". University of Oregon. Archived from the original on July 22, 2012. Retrieved July 22, 2012. ^ a b Ravilious, Kate (June 9, 2010). "World's Oldest Leather Shoe Found—Stunningly Preserved". National Geographic. Archived from the original on July 24, 2012. Retrieved July 22, 2012. ^ Petraglia, Michael D.; Pinhasi R; Gasparian B; Areshian G; Zardaryan D; Smith A; et al. (2010). Petraglia, Michael D., ed. "First Direct Evidence of Chalcolithic Footwear from the Near Eastern Highlands". PLoS ONE. 5 (6): e10984. doi:10.1371/journal.pone.0010984. PMC 2882957. PMID 20543959. Reported in (among others) Belluck, Pam (9 June 2010). "This Shoe Had Prada Beat by 5,500 Years". The New York Times. Archived from the original on 11 June 2010. Retrieved 11 June 2010. ^ Johnson, Olivia (August 24, 2005). "Bones Reveal First Shoe-Wearers". BBC News. Archived from the original on June 3, 2012. Retrieved July 23, 2012. ^ Laubin, Reginald; Laubin, Gladys; Vestal, Stanley (1977). The Indian Tipi: Its History, Construction, and Use. Norman, Oklahoma: University of Oklahoma Press. ISBN 978-0-8061-2236-6. Archived from the original on 2018-04-27. ^ Kendzior, Russell J. (2010). Falls Aren't Funny: America's Multi-Billion-Dollar Slip-and-Fall Crisis. Lanham, Maryland: www.govtinstpress.com/ Government Institutes. p. 117. ISBN 978-0-86587-016-1. Archived from the original on 2017-03-19. ^ Kippen, Cameron (1999). The History of Footwear. Perth, Australia: Department of Podiatry, Curtin University of Technology. ^ a b c d e DeMello, Margo (2009). Feet and Footwear: A Cultural Encyclopedia. Santa Barbara, California: ABC-CLIO, LLC. pp. 20–24, 90, 108, 130–131, 226–230. ISBN 978-0-313-35714-5. ^ a b c Frazine, Richard Keith (1993). The Barefoot Hiker. Ten Speed Press. p. 98. ISBN 978-0-89815-525-9. ^ "Unearthing the First Olympics". NPR. July 19, 2004. Archived from the original on July 28, 2010. Retrieved July 1, 2010. ^ Krentz, Peter (2010). The Battle of Marathon. New Haven and London: Yale University Press. pp. 112–113. ISBN 978-0-300-12085-1. Archived from the original on 2018-04-27. ^ Turpin, Zachary. "Winning the Boston Marathon, With or Without Shoes". Book of Odds. Archived from the original on June 24, 2012. Retrieved July 18, 2012. ^ Genesis 14:23, Deuteronomy 25:9, Ruth 4:7-8, Luke 15:22. ^ Blair, John (1991). English Medieval Industries: Craftsmen, Techniques, Products. London: Continuum International Publishing Group. p. 309. ISBN 978-0-907628-87-3. Archived from the original on 2016-04-25. 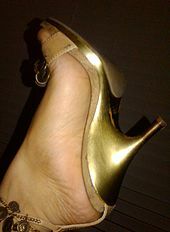 ^ a b "Dangerous Elegance: A History of High-Heeled Shoes". Random History. Archived from the original on July 28, 2010. Retrieved July 1, 2010. ^ The Encyclopaedia of the Renaissance. Market House Books. 1988. ISBN 978-0-7134-5967-8. ^ Yue, Charlotte (1997). Shoes: Their History in Words and Pictures. New York City: Houghton Mifflin Company. p. 46. ISBN 978-0-395-72667-9. Archived from the original on 2016-05-27. ^ a b c "History of Shoemaking in Britain – Napoleonic Wars and the Industrial Revolution". Archived from the original on 2014-02-02. ^ R. A. McKinley (1958). "FOOTWEAR MANUFACTURE". British History Online. Archived from the original on 2014-02-03. ^ Charles W. Carey (2009). American Inventors, Entrepreneurs, and Business Visionaries. Infobase Publishing. p. 27. ISBN 9780816068838. ^ O'Sullivan, Gary B (2007). The Oak and Serpent. Lulu. p. 300. ISBN 978-0615155579. Retrieved 2019-01-24. ^ Clark, Brian (October 24, 2009). "Biodegradable... Shoes??". The Daily Green. Archived from the original on September 20, 2012. Retrieved July 23, 2012. ^ "What is Nike Considered?". Nike, Inc. Retrieved July 23, 2012. ^ "Ground-breaking Technology Brings World's First Biodegradable Midsole to Runners". CSR Press Release. November 15, 2007. Archived from the original on July 28, 2012. Retrieved July 23, 2012. ^ "Global Footwear Manufacturing Industry Market Research Report". PRWeb. June 7, 2012. Archived from the original on March 13, 2013. Retrieved July 24, 2012. ^ Lake, Matt; Moran, Mark; Sceurman, Mark (2005). Weird Pennsylvania: Your Travel Guide to Pennsylvania's Local Legends and Best Kept Secrets. New York City: Sterling Publishing Co. p. 131. ISBN 978-1-4027-3279-9. Archived from the original on 2016-03-06. ^ Skidmore, Sarah (15 January 2007). "Sneakerheads Love to Show Off Their Shoes". The Washington Post. Archived from the original on 12 November 2012. Retrieved 2 July 2011. ^ "Czech 'Sneakerheads' Flaunt Their Best Trainers". Czech Position. Archived from the original on 20 June 2011. Retrieved 2 July 2011. ^ Gammell, Caroline (December 15, 2008). "Arab Culture: The Insult of the Shoe". The Daily Telegraph. Archived from the original on July 25, 2012. Retrieved July 24, 2012. ^ Asser, Martin (December 15, 2008). "Bush Shoe-ing Worst Arab Insult". BBC News. Archived from the original on October 16, 2012. Retrieved July 24, 2012. ^ Arab culture: the insult of the shoe Archived 2018-03-12 at the Wayback Machine, The Telegraph, 15 December 2008. ^ Bush shoe-ing worst Arab insult Archived 2012-05-30 at the Wayback Machine, BBC, 16 December 2008. ^ Reeve, Andru J. (2004). Turn Me On, Dead Man: The Beatles and the "Paul Is Dead" Hoax. Bloomington, Indiana: AuthorHouse. p. 79. ISBN 978-1-4184-8294-7. Archived from the original on 2016-04-27. ^ Karak, Niranjan (2009). Fundamentals Of Polymers: Raw Materials To Finish Products. New Delhi: PHI Learning Private Limited. pp. 263–264. ISBN 978-81-203-3877-7. Archived from the original on 2016-05-13. ^ a b c d e f Vonhof, John (2011). Fixing Your Feet: Prevention and Treatments for Athletes. Birmingham, Alabama: Wilderness Press. pp. 58–59. ISBN 978-0-89997-638-9. Archived from the original on 2016-05-06. ^ Oliver Sweeney Ltd. "Home Page – Oliver Sweeney". oliversweeney.com. Archived from the original on 2014-10-04. ^ Suddath, Claire (June 15, 2010). "A Brief History of: Velcro". Time. Archived from the original on September 13, 2012. Retrieved July 30, 2012. ^ Frank, Robert H. (2007). 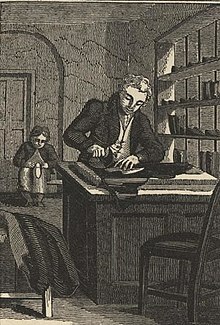 The Economic Naturalist: In Search of Explanations for Everyday Enigmas. New York City: Basic Books. p. 174. ISBN 978-0-465-00217-7. Archived from the original on 2016-05-12. ^ Edelstein, Joan E.; Bruckner, Jan (2002). Orthotics: A Comprehensive Clinical Approach. SLACK Incorporated. p. 21. ISBN 978-1-55642-416-8. ^ Ward, Julie (September 13, 2005). "Next big step in team spirit: Flip-flops". USA Today. Archived from the original on August 9, 2011. Retrieved July 19, 2012. ^ Lister, Richard (February 19, 2010). "Flip-flop Diplomacy With the Dalai Lama". BBC News. Archived from the original on October 16, 2012. Retrieved July 19, 2012. ^ McGinnis, Peter M. (2005). Biomechanics of Sport and Exercise (Second Edition). Champaign, Illinois: www.humankinetics.com. p. 26. ISBN 978-0-7360-5101-9. Archived from the original on 2016-04-29. ^ Peterson, Hal (2007). Chucks! : The Phenomenon of Converse Chuck Taylor All Stars. New York City: Skyhorse Publishing. ISBN 978-1-60239-079-9. Archived from the original on 2016-05-11. ^ Papson, Stephen; Goldman, Robert (1998). Nike Culture: The Sign of the Swoosh. London: SAGE Publications. p. 47. ISBN 978-0-7619-6148-2. Archived from the original on 2016-05-17. ^ Winters, Dan (November 2010). "Is Less More?". Runner's World. Archived from the original on July 28, 2012. Retrieved July 23, 2012. ^ "Vibram FiveFingers Named A "Best Invention of 2007" by Time Magazine". trailspace.com. 12 November 2007. Archived from the original on 13 May 2010. Retrieved June 26, 2010. ^ Cortese, Amy (August 29, 2009). "Wiggling Their Toes at the Shoe Giants". The New York Times. Archived from the original on April 4, 2011. Retrieved July 1, 2010. ^ "Saucony Progrid Kinvara Running Shoe Review: Runner's World". Runner's World. February 15, 2008. Archived from the original on September 11, 2011. Retrieved September 3, 2011. ^ Jhung, Lisa (May 2011). "Saucony Minimalism". Runner's World. Archived from the original on 2011-05-06. Retrieved August 17, 2011. ^ McDougall, Christopher (2011). Born to Run: A Hidden Tribe, Superathletes, and the Greatest Race the World Has Never Seen. New York City: Vintage Books. pp. 168, 172. ISBN 978-0-307-27918-7. Archived from the original on 2016-06-24. ^ Welinder, Per; Whitley, Peter (2012). Mastering Skateboarding. Champaign, Illinois: Human Kinetics. p. 8. ISBN 978-0-7360-9599-0. Archived from the original on 2016-06-24. ^ International Police Mountain Bike Association (2008). The Complete Guide to Public Safety Cycling. Sudbury, Massachusetts: Jones & Bartlett Publishers. p. 45. ISBN 978-0-7637-4433-5. Archived from the original on 2016-05-19. ^ DeWeese, G. Daniel (June 29, 2010). "The Functional Side of Cowboy Boots". True West Magazine. Archived from the original on October 16, 2012. Retrieved August 10, 2012. ^ Chand, Elise Gaston (2009). A Parent's Guide to Riding Lessons: Everything You Need to Know to Survive and Thrive With a Horse-Loving Kid. North Adams, Massachusetts: Storey Publishing. p. 91. ISBN 978-1-60342-447-9. Archived from the original on 2016-05-10. ^ Howe, Steve (March 2002). "Boots". Backpacker. Archived from the original on March 18, 2013. Retrieved August 10, 2012. ^ Stimpert, Desiree. "What Makes a Boot a Snow Boot". About.com. Archived from the original on July 23, 2012. Retrieved August 10, 2012. ^ Bellis, Mary. 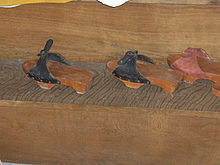 "History of Ice Skates". About.com. Retrieved August 10, 2012. ^ Olsen, Scott & Brennan. "Inline-Skates". lemelson.mit.edu. Archived from the original on May 2, 2006. Retrieved August 10, 2012. ^ Flusser, Alan. "Dressing the Man" Harper Collins, 2002, pg 189. ^ "Ask Andy About Clothes". Archived from the original on 2010-12-12.